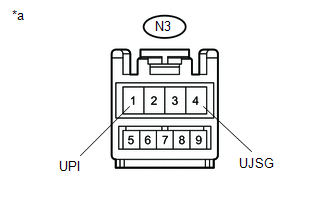 When a USB device or "iPod" is connected to the USB jack of the No. 1 stereo jack adapter assembly, it must have playable files. The device must also communicate with and be recognized by the navigation receiver assembly. This diagnosis procedure is for when a device is not recognized, or files from the device cannot be played normally. When using a USB device, files that are protected by copy protection cannot be played. 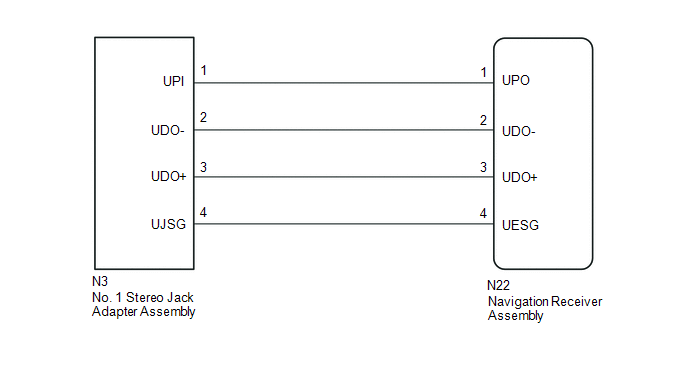 (a) Disconnect the N3 No. 1 stereo jack adapter assembly connector. (b) Disconnect the N22 navigation receiver assembly connector. (a) Reconnect the N22 navigation receiver assembly connector. (a) Check if a USB device or "iPod" is recognized by the navigation receiver assembly, and if information such as track, artist and album names are displayed on the screen.